We all have data - tons of data. We have data like personal family photos and critical enterprise databases. It’s a scary time for data. Whether it’s personal data or critical enterprise data - it’s being held hostage by evil attackers from around the world. Ransomware is running rampant and it’s our job to protect it. But how? In this Ransomware Defense 101 webinar we’ll be joined by one of the most respected ransomware experts in the industry today. 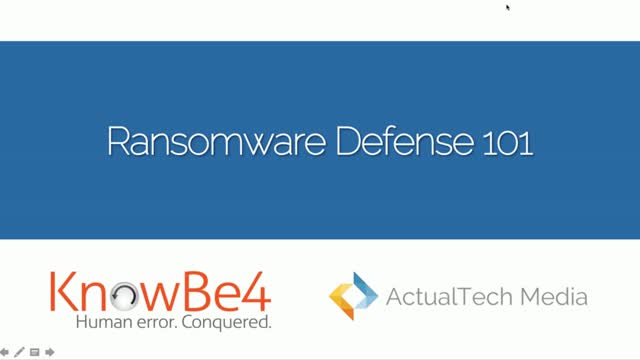 CISSP and veteran security expert Erich Kron of KnowBe4 will answer the most common ransomware defense questions, tell you what you need to know to protect your organization, like creating a “human firewall” as your last line of defense.